When I created the collection of art for my Solo Exhibition titled ‘Forsaken’ I had not heard of Constantin Severin’s terminology; ‘archetypal expressionism’. At the time, my mission was to create art-works to portray an ancient people; their history, ‘sacred legend carriers’ and ‘sacred symbols/hieroglyphs’. More importantly it was a deep internal spiritual journey to discover my origins and ultimately my mission as an artist. When first reading Constantin Severin’s definition of ‘archetypal expressionism’ I felt as though he was describing the process I used to create my ‘Forsaken Collection’. I was and still am elated, because finally I am connected to another person, furthermore another artist, who not only truly understands my art-form but can articulate it into words. Here in New Zealand, a lot of Maori Culture & Art is based upon that which has become known from last 200 or so years. It is wonderful to see contemporary indigenous/Maori art evolve from the carvings and weaving of the 1800’s and early 1900’s . However, in saying this, my quest is to connect with my ancient, historic origins; to do this I have spent 100’s of hours researching and seeking inner spiritual contact with my Tupuna (Ancestors). Additionally I’ve spent 100’s of hours playing with shapes, symbols, paint, mixed media and various supports. I’ve only scratched the surface; there is a multitude of images within me waiting to be rendered, manifested into the physical realm. It is a juggle prioritising time between producing them or art for commissions, exhibitions and awards. The constant internal struggle to earn a living versus living my art; my ultimate goal is to earn a living from living my art, ‘archetypal expressionism’. Kia ora Constantin, Arohanui tane. 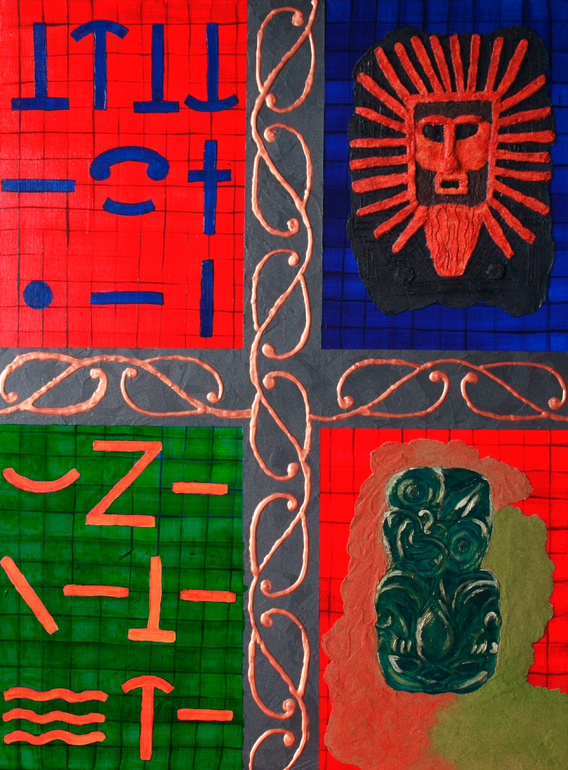 This entry was posted in Art and tagged archetypal expressionism, archetypal expressionism debate, constantin severin, maori art, new zealand, tepora watene. Bookmark the permalink.